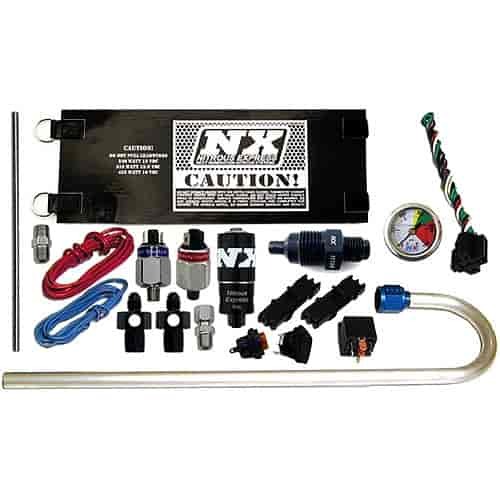 The NX automatic pressure controlled bottle heater will keep your bottle pressure where you need it for bumper dragging launches and killer top end performance. We include a NX nitrous pressure gauge which features a color coded bezel allowing you to quickly verify if your bottle is in the optimum pressure zone. The Gen-X package includes relays, switches, wiring and all needed hardware to make the install easy and pain free. For use with -04AN Feedline. Switch has a 50psi working window for consistent bottle pressure. With over 60 square inches of heating area that can produce 300+ degree surface temperatures, a Nitrous Express Nitrous Bottle Heater can take a bottle from ice cold to operating pressure in minutes. They maintain the correct pressure under the most demanding conditions by using an industry exclusive internal bottle pressure controlled switch instead of a temperature probe. The adjustable pressure switch is pre-set to begin heating the bottle at 1050psi but can be adjusted from 900psi to 1200psi, the 50psi working window maintains the optimum bottle pressure for your nitrous system with an ultra low amp draw. The finishing touch to a great nitrous system.